Habitat: Grows best in dry, sandy and chalky soils. Native to Europe, North Africa and Asia, neutralized in Australia and America. Description: Dicotyledonous, biennial plant, grows up to 2 meters. It has large, oblong to oblanceolate leaves, and an unbranched stem (1 to 2 meters tall), ending with a compact spike of flowers. Flowering starts in early summer, and lasts up to three months. Flowers are usually small and yellow, densely sticking from the rosette of leaves. 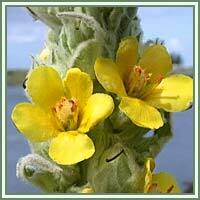 Medicinal use: Great Mullein is considered to be a very good emollient and is used for a variety of skin conditions. It is also an effective treatment for dry cough, bronchitis and sore throat. 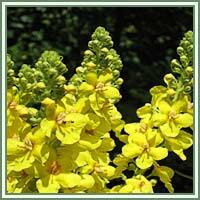 Oil obtained from the flowers was traditionally used against ear arches, colics and catarrhs. The plant is considered to be expectorant, antibiotic, astringent and anti-inflammatory. In American Indian traditional medicine, dry leaves were smoked to treat various lung disorders (asthma, bronchitis). Tea prepared from the flowers has strong sedative qualities, and is very useful in treatment of migraine. Safety: Leaves are rubefacient. Seeds are reported to be toxic. Some herbs could react with certain medication. Therefore, it is highly advisable to consult your doctor before consumption of any herb.